No one (to The Drachen Foundation’s knowledge) owns an original Roch Donzella “Monobloc” kite from 1911. 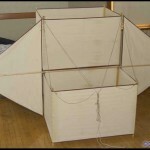 So DF recently added to its archive a replica, constructed under the careful tutelage of historical kite researcher and builder, Falk Hilsenbek. 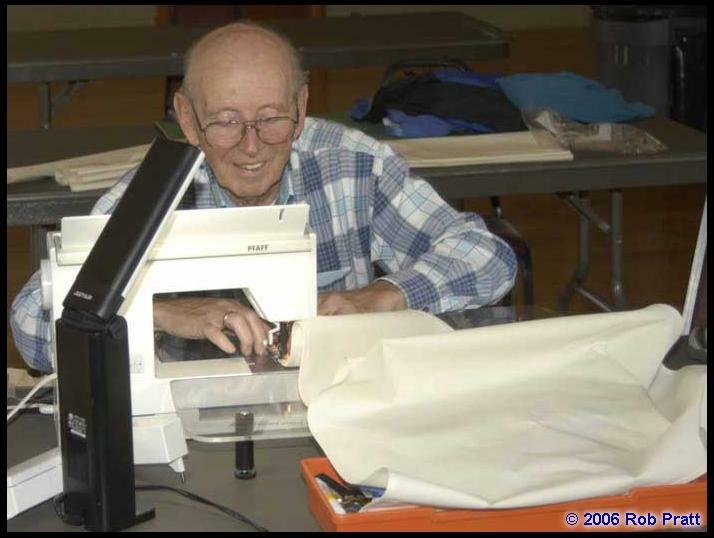 Read on to find out more about the significance of this kite, and learn how you can participate in an upcoming historical kite workshop, at Apeldoorn in November 2006. During the final quarter of the nineteenth and the beginning of the twentieth centuries, an “aeronautical ferment” (in Richard Hallion’s phrase) swept France. 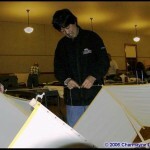 It encompassed the world of kiting as well. 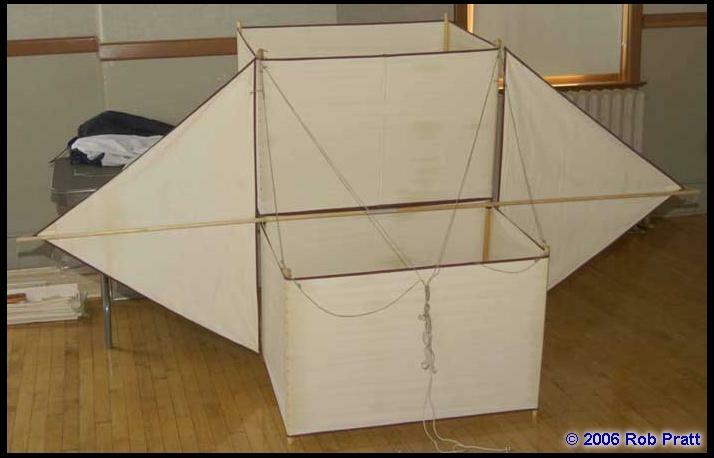 France was home not only to the French Aerial Navigation Society but also to the French League of Kites, developed to provide federal support for experimental studies with kites. 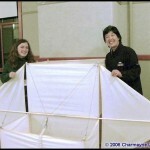 The journal Le Cerf-Volant detailed the discoveries and disputes of kite innovators, among them Le Cornu, Saconney, and Houard. Roch Donzella was a member of this group, and published in Le Cerf-Volant an article about his 1911 “Monobloc” kite, entitled “Monocellulaire et décentré.” In it he discusses questions raised by Pujo about the stability in heavy winds of a single-celled “apparatus” [appareil]. 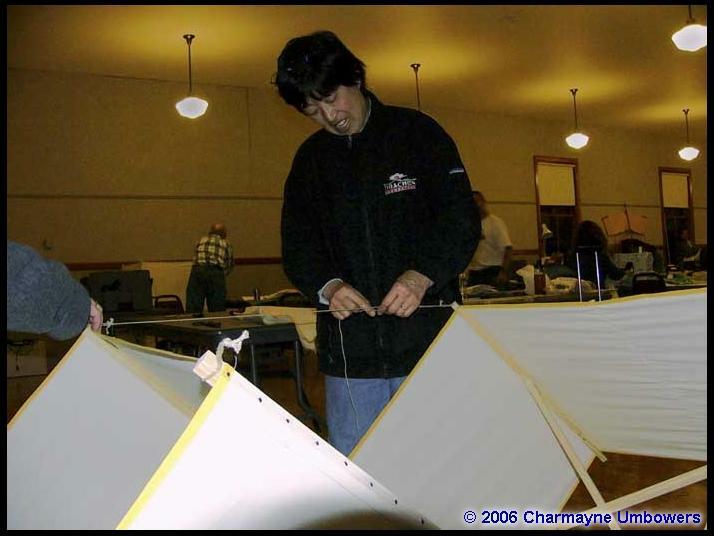 He points to Hargrave’s experiments with winged box kites and explains his own devotion to triangular wings. Roch Donzella then sets himself the challenge of “constructing an apparatus uniting at the same time the qualities of the ‘décentré’ (stability, solidity, traction) and those of the ‘monocellulaire’ (simplicity, lightness, good angle).” He reasons, “One cell may be stable; it thus stands to reason that two [cells] will surely be so.” He will set the two rectangular cells one above the other, without any “thickening” or “spreading” between them, but not on the same axis (thus off-center), to take best advantage of the “nets of air” [filets d’air]. 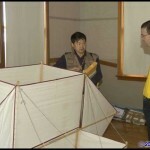 Smaller triangular wings will reduce the weight of the apparatus without “injuring” its “solidity.” He expresses full confidence that “all kite fliers” will be able to construct a similar apparatus based on these principles, according to his drawings and dimensions. He then describes in great detail his test flight at Dunkerque, on February 19th, in a field 200 x 75 meters, surrounded by grand houses and trees, which create a “veritable basin [cuvette] where vortexes [tourbillons] were followed by ‘pockets of air’ [‘trous d’air’].” In fact, he says, the wind smashed some “very stable Hargraves” into the ground “more than once.” His kite, on the other hand, mounted rapidly, at an angle of 45 to 50 degrees. When it came to landing, the kite was caught by a gust of air, barely cleared the tops of the trees some thirty meters away, and fell to the ground with the “speed of a stone.” But, he declares, it broke only one “croisillon” in the process. Roch Donzella concludes from this test that “the apparatus has thus proved its admirable characteristics, withstanding without weakening a tempest-like wind and a return to earth under the very worst conditions with minimal damage.” Bridle adjusted on the following day, the kite achieves even better results, despite a lessening of the wind. Roch Donzella decides to name it (if Pujo consents) the “monobloc” because of its “slightly massive shape” [sa forme un peu massive]. The article ends with his speculations that the apparatus could be even further improved by constructing it “obliquely” or by diminishing its “density” through a Cody “assembly” or the use of different materials. 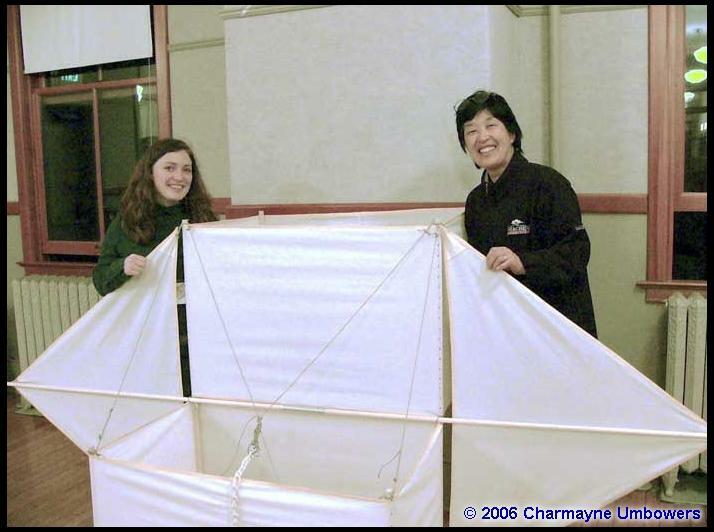 Three cells and two pairs of wings might have such stability and “elegant allure” as to “seduce” even more kite makers into experimenting with the form. 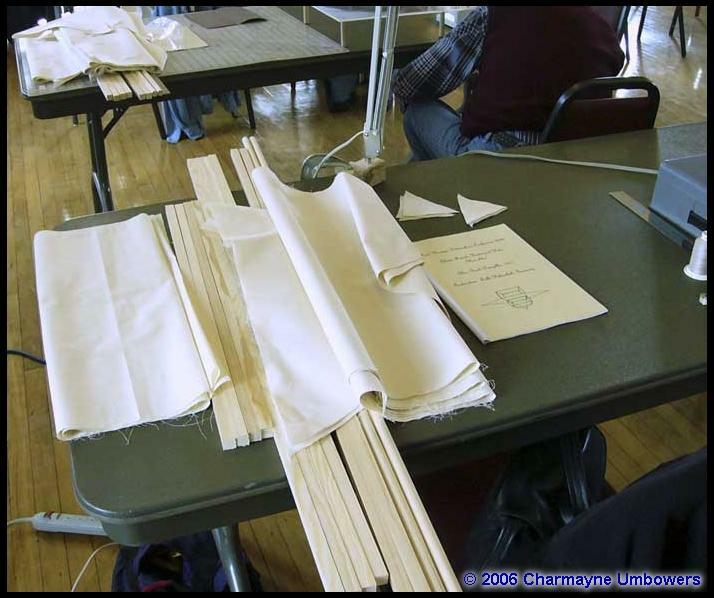 If you are intrigued by the subject of historical kites, plan to join historical kite specialists at a sixth annual workshop in Apeldoorn, the Netherlands, on November 10-12, 2006. 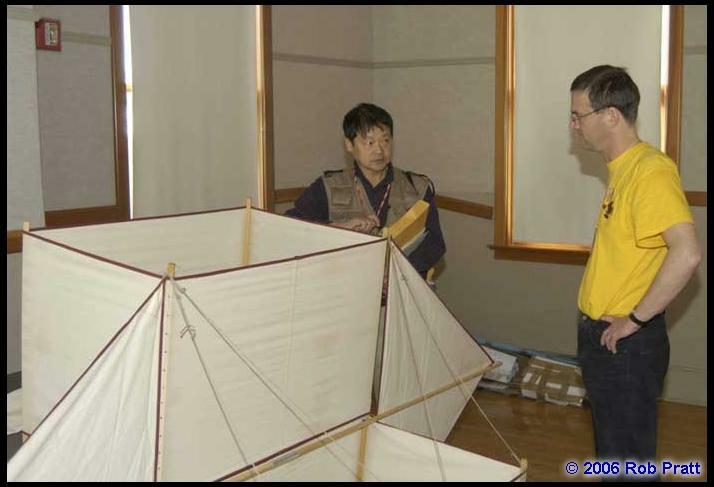 Participants will hear presentations by Jan Desimpelaere of Belgium about Russian meteorological and military kites and by Hans-Ullrich Draheim of Germany about his collection of World War II kites and memorabilia. 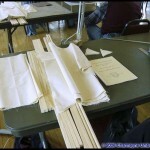 They will also construct a turn-of-the-last-century children’s kite from the Roach catalogue. 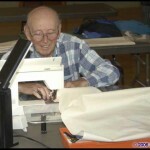 The Drachen Foundation is helping to organize the workshop. For further information, contact Douwe Jan Joustra at d.j.joustra@chello.nl. The Drachen Foundation thanks Dr. Judith Suther for advice and review of its French translation. 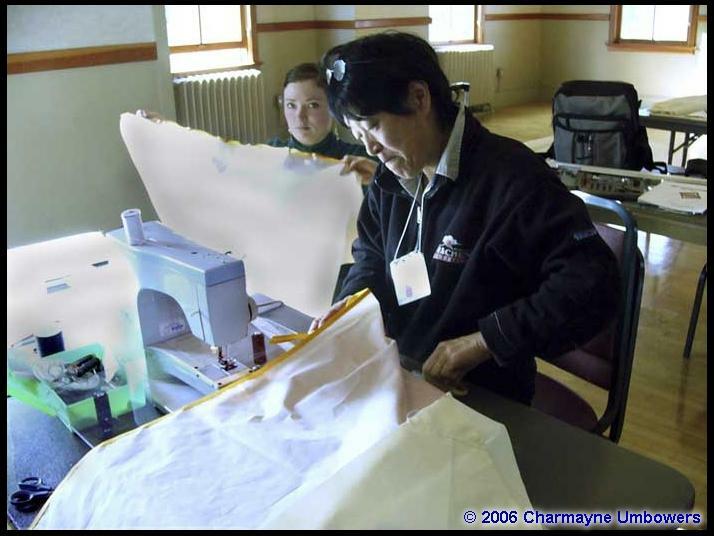 This entry was posted in 2006, Drachen, General Topics, Issue 48 (May/Jun), Kite Columns, Kite Making, KL Archive and tagged art, drachen, kite building, kite making.